Founded in 1974 by the late Shihan Fumio Toyoda, the Northwestern University Aikido Club (formally Zanshinkan dojo) is a club dedicated to practicing the martial art of aikido. All Northwestern undergraduates, graduate students, staff members, and faculty are welcome to join the club. No experience is necessary, and you may join during any time of the year. Interested in aikido? Come out a try a few classes for free. Come to any class wearing free moving athletic clothing that covers your knees and we will get you started. You will be given basic instruction on falling and practicing safely during your first class. Feel free to e-mail us with any questions at NUaikido@gmail.com. 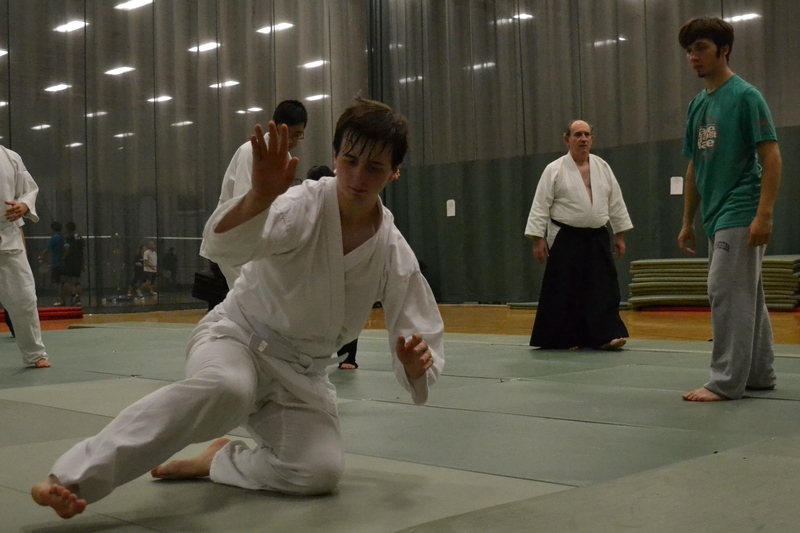 The aikido club holds classes in the SPAC facility in Studio 1B. We set up the mats prior to class, so please come a few minutes early. If you are new to Aikido or martial arts feel free to stop by any time to check out our practice. Occasionally there are days when SPAC is closed and we do not have class, so double check our Calendar before stopping by. We also train during the summer quarter, please contact is for additional schedule details. If you decide to join, club dues are only $35 per quarter. Ranked members are expected to maintain a current membership with Shimbokukai, the Aikido organization we are affiliated with (dues are $50 per year). Members may attend as few or as many classes per week as fits their schedule. For information on our instructors please visit the People section. Aikido, “The Way of Harmony,” is a Japanese martial art, developed over the first third of the last century by Morihei Ueshiba. However, roots of Aikido are much older and many techniques are draw from older martial arts traditions, particularly swordsmanship. Aikido does not depend on raw speed or brute strength, but rather emphasizes timing (kokyu), distance (ma-ai), and the extension of centered, whole-body energy ( kiai). In Aikido, we do not seek to destroy an attacker; rather, we destroy an attack, rendering it useless, through an almost infinite combination of 4 essential types of techniques: Dynamic throws (nage-waza), strikes (atemi-waza), pinning techniques (osae-waza) and joint locking techniques (kansetsu-waza). Learning how to safely receive an attack is also part of Aikido and is key in studying more advanced techniques. Beginners are instructed first and foremost in how to fall safely, and how to move the body properly, and introduced to simple techniques which utilize these basic movements. Gradually, a greater intensity and complexity of Aikido practice is introduced, at a level suited to the individual student’s development. Aikido is a martial art meaning that can be an effective self defense tool and that many of its techniques can cause serious injury to an attacker. However, the goal of Aikido is not to learn to fight or sport. Instead, Aikido strives to develop a harmony with your own body and mind such that you can perceive and react to any situation. This can mean recognizing a dangerous situation and avoiding it entirely or disabling and redirecting an attacker in self defense. Because much of Aikido’s basic body movement (tai-sabaki) is drawn from Japanese Swordsmanship, Aikido training at Northwestern University Aikido Club involves both empty-hand (toshu-waza) and weapons practice (buki-waza). The traditional Aikido training weapons – the wooden sword (bokken), wooden staff (jo) and wooden knife (tanto) – are utilized regularly. As a Budo (martial Way of life) and not merely a physical art, Aikido stresses the peaceful resolution of conflict whenever possible. teachings of the samurai heritage: “True victory is victory over the self”. Our parent dojo is Shinjinkai (which can be translated as “True Heart Society”). During the school year all club members are welcome to train at Shinjinkai for a modest mat fee per session. During the summer club members may train at Shinjinkai at a discounted student rate. 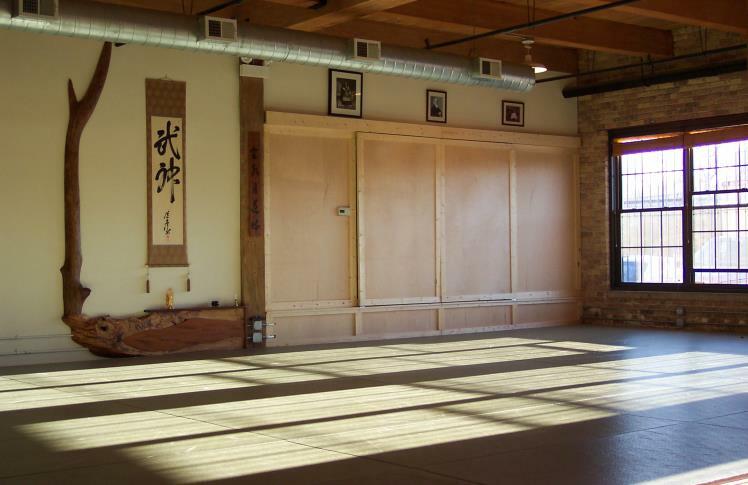 Shinjinkai in Chicago is affiliated with Aikido World Headquarters (The Aikikai Foundation) through Aikido Shimbokukai. Some supplementary materials (e.g., lists of exercises, names of techniques) for the Northwestern University Aikido Club can be found here.